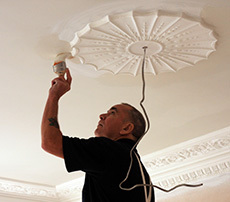 Devon Select Decorators, formally Simon Taylor Decorators, have over 10 years of experience completing work to a high standard, cleanly and efficiently in domestic environments and new builds. Simon Taylor, head decorator at Devon Select Decorators, have completed work on various commercial jobs for businesses who have been in need of a painter and decorator in Exeter. We work to a high standard, paying fine attention to detail, such as keeping your fittings and furnishings clean, ensuring surfaces are sanded down thouroughly and efficiently which is all part of our fantastic services at Devon Select Decorators, formally Simon Taylor Decorators. We are available to work for domestic and commercial clients throughout Exeter and the surrounding areas of Devon. Here are Devon Select Windows, formally Simon Taylor Decorators, we are a team of fully insured painters and decorators, who have CSCS Health & safety certificate and (at the time of writing) are active members of the Painting and Decorating Association. Working throughout Exeter and the surroundng Devon areas, Devon Select Decorators, use a full range of paints and wallpapers including Dulux, Crown, Farrow & Ball, Fired Earth to name a few.